It hasn’t been more than a few hours and already key details of Donald Trump Jr.’s meeting with Senate investigators have already leaked. According to the New York Times, Trump Jr. took the ‘Russia meeting’ to gauge Hillary Clinton’s ‘fitness’ for office. A copy of Mr. Trump’s statement was obtained by The New York Times. The acknowledgment by the president’s eldest son that he intended to seek legal counsel after the meeting suggests that he knew, or at least suspected, that accepting potentially damaging information about a rival campaign from a foreign country raised thorny legal issues. Mr. Trump sat down with committee investigators in the Capitol shortly before 9:30 a.m. and was expected to remain under questioning for several hours. The interview was being conducted by staff, but a handful of Democratic senators attended. Mr. Trump entered the Capitol under cover and did not speak with reporters. 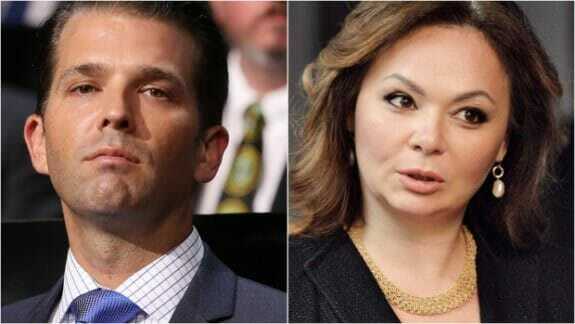 Reuters recently reported grand jury subpoenas have been issued in connection with the meeting between Donald Trump Jr. and Russian lawyer Natalia Veselnitskaya last June. The sources also said special counsel Robert Mueller had convened a grand jury in Washington to investigate allegations of Russia’s interference in the 2016 elections. As TGP previously reported, The New York Times published another hit piece on the Trump Campaign and a meeting with Russia. The New York Times got another anonymous tip from officials that revealed Trump insiders met with a Russian lawyer to discuss adoptions from Russia. TGP also previously reported that the lawyer who met with the Trump team was denied a U.S. visa to enter, however; she received special permission to enter the United States after filing an affidavit in a Federal case in New York.